The Wolfgang Cockpit Clean & Protect Kit includes two essential interior care products that replace the need for 3, 4, or even 5 separate cleaners and protectants. This kit includes Wolfgang’s gentle and effective Leather Care Cleaner and Wolfgang’s innovative Cockpit Trim Sealant. Wolfgang Leather Care Cleaner safely cleans virtually every interior surface while Wolfgang Cockpit Trim Sealant provides the utmost in surface protection for leather, wood and aluminum trim, vinyl and more! With this kit you can keep your vehicle’s interior looking showroom fresh for years. Keep your leather looking its very best. Wolfgang Leather Care Cleaner is a gentle, pH balanced, 100% biodegradable cleaner that utilizes the natural cleaning strength of citrus to remove virtually any dirt, grease, ink, oil, or spills from your leather. It penetrates deep into the pores and gently lifting away foreign particles, pollution and contaminants, including microscopic dirt particles that build up over time. This water-based, pure cleaner contains no petroleum distillates, silicon oils or gloss agents, therefore will not dull, stain or cause drying of your leather. Wolfgang Cockpit Trim Sealant is an invisible, advanced synthetic polymer coating that provides a durable coating of protection and beauty to all leather, plastic, vinyl, rubber, wood and metal interior trim! Wolfgang Cockpit Trim Sealant replaces the need for multiple products! Wolfgang Cockpit Trim Sealant stops deterioration in its tracks with one simple and easy to use product that will cover the surface with a clear synthetic polymer coating. Leather surfaces will remain soft and supple when coated with Wolfgang Cockpit Trim Sealant. Apply to leather and vinyl armrests to prevent body oils from staining the surface. Use these microfiber detailing cloths for drying, buffing, or as a finishing wipe down. Microfiber is designed to be light, strong, super-absorbent and quick drying. The fibers are non-abrasive, and are woven so tightly that it’s absolutely lint free and extremely durable. Unbelievably, these ultra-tough fibers are engineered to absorb seven times their weight in moisture. 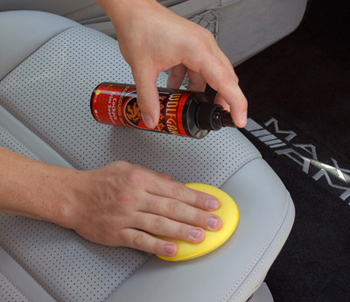 Use the microfiber applicator pads for applying Wolfgang Leather Care Cleaner. The detailing microfiber pad has recently been upgraded to a denser, thicker, and softer fabric. 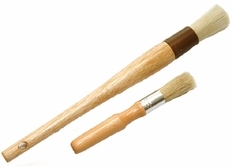 These are ideal for agitating delicate leather surfaces as they are very gentle. Foam applicators are best used to apply the Cockpit Trim Sealant quickly and evenly. A total retail value of $75.94. You save $15.95!